Here you will find a complete list of the hand embroidery stitch tutorials. This includes the basic stitches that every beginner to embroidery should learn, as well as variations of well-known embroidery stitches and stitches for a wide range of embroidery types. Work your way through the list until you've mastered them all. The back stitch is a basic embroidery and sewing stitch used to produce a thin line of stitching, to outline shapes that will be filled with satin stitch, or to stitch fabric pieces together. Blanket stitch is a basic stitch that can be worked as a surface embroidery stitch, as an edging or to ​applique elements in place on an embroidery project. It is worked using open half-loops of stitching, similar to a hand-worked buttonhole stitch. The basic chain stitch is useful for working bold lines of embroidery. There are two ways to work the stitch: forward and reverse. Choose the method you find easier. Chain stitch also makes an excellent fill stitch, covering a large area quickly. Learn to work a single, detached chain stitch. You'll use this teardrop or petal shaped stitch frequently as accents, scattered fill stitching and in all kinds of floral embroidery. The feathered chain stitch is a decorative hand embroidery stitch that utilizes detached chain stitches arranged in a zig-zag pattern as if working the feather stitch, forming a hybridized stitch. This highly textured surface embroidery stitch is wider than a standard chain stitch, making it perfect for use in wide bands and rows. Chevron stitch is a surface embroidery stitch worked using long diagonal stitches topped with a horizontal cap stitch. 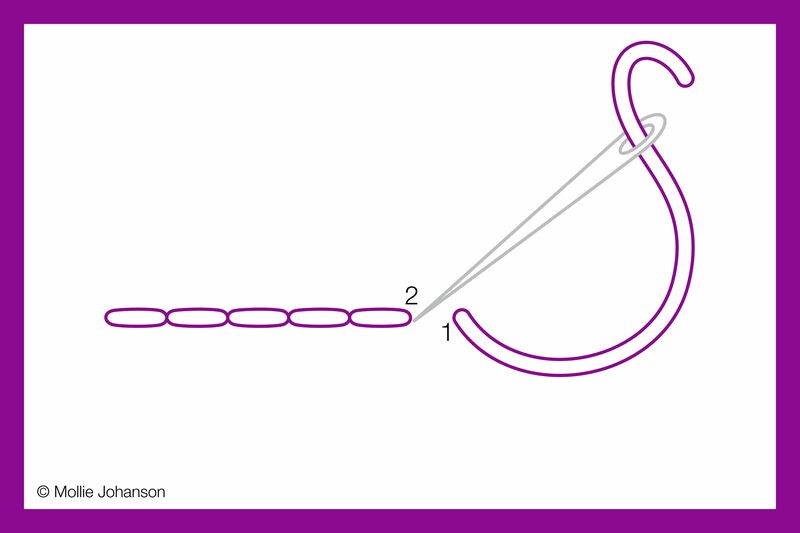 This stitch can be used in straight rows and bands. It can also be stitched along a curved edge if guidelines are carefully marked on the fabric. The colonial knot looks similar to a French knot, but it is a tighter and sturdier knot used in surface embroidery, especially candlewick embroidery. 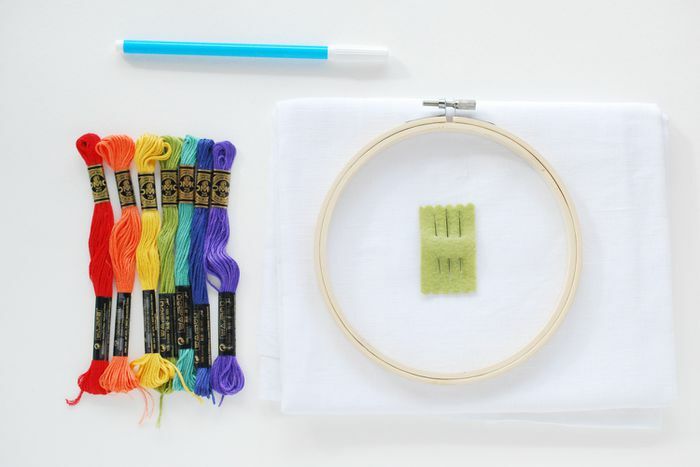 If you struggle with French knots, try colonial knots instead. Coral stitch, sometimes called coral knot, is a knotted stitch worked along a line. The result is a textured line with a slightly bumpy look. You can work the individual stitches or knots close together or with some space between them to vary the look of this stitch. Use couching stitch when working with embroidery threads, yarns or ribbons that you want to leave on the surface of the fabric. Rather than working the main thread through the material, this stitch essentially tacks the main thread into place. You can also use couching stitch for filling an area with texture. Open Cretan stitch is similar to feather stitch, as it uses interlocking curved stitches, but is made using stitches that are vertical along the top and bottom edges, rather than curved. It can be used to outline shapes, as a border, or to join two pieces of material together using a decorative, open lacy stitch. Unlike standard cross stitch, which is worked diagonally, Chinese cross stitch is worked using a single horizontal and two vertical straight stitches (groups of three). It makes a pretty border or edging on a project, and can be worked in a single row, or multiple rows. The stitching area can be pre-marked on the fabric, worked freestyle, or worked as a counted stitch. The long-armed cross stitch, sometimes referred to as an elongated cross stitch, can be worked in bands and rows, or to outline or frame a section of a design in counted thread embroidery projects. The stitch is worked nearly identically to a standard cross stitch, with the exception that the second leg of the stitch is elongated. When worked in rows, the stitches cross each other and resemble a braid. Feather stitch is light and airy, creating an open line of embroidery stitching that can be used for borders, around shapes or to attach appliques. There are quite a few variations of this stitch in this tutorial, including closed feather stitch, double feather stitch, single feather stitch and straight feather. The fern stitch is a surface embroidery stitch used to create an open, lacy stitch along a straight or curved line. It's beautiful worked as tree branches, ferns, or seaweed in a project. Each section of the fern stitch is worked as a group of three straight stitches, all worked into the same ending hole. The groups are stitched repeatedly to make a row. Fly stitch is a surface embroidery stitch that can be worked in several ways. As a single stitch, you can alter the look of it, including making curved or scalloped stitching. It's also useful for fill stitching or to form a decorative line. The French knot can be daunting to stitchers but is easy to work after a bit of practice. This guide, with tips for keeping even tension on your knot, will get you started. Herringbone stitch is worked along parallel lines on an evenweave fabric. These lines can be marked or you can count the threads in your fabric to space the stitches. Variations on this stitch include double herringbone, tied herringbone, and laced herringbone stitch. 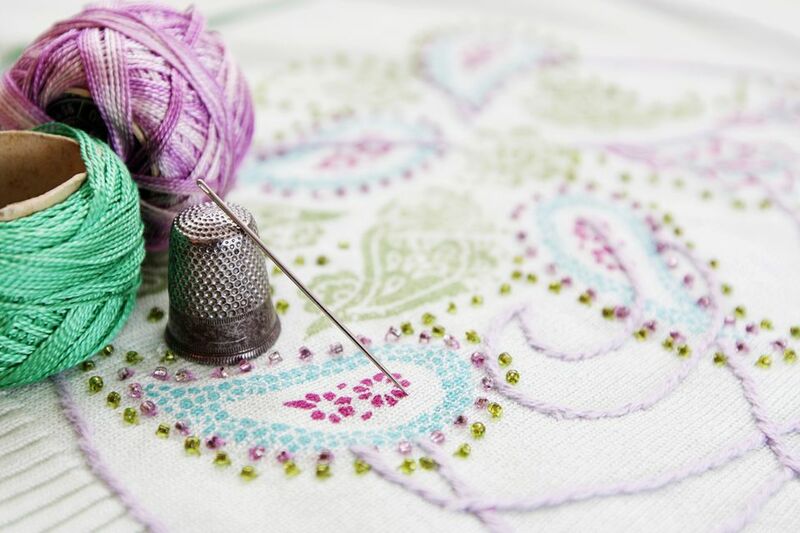 A basic laid filling stitch makes a pretty, open filling and is perfect for flower petals and leaves in both surface embroidery and crewel projects. Learn how to work these stitches both in straight and diagonal formations. Pekinese stitch is a beautiful stitch that's also very easy to learn. It starts with back stitch, followed by a series of simple looped stitches that give it a more complex look. Try working this stitch all in one color for a textured appearance or in two colors for a fun contrast. When learning silk ribbon embroidery, ribbon stitch is essential, and in fact, it's exclusive to this type of embroidery. The stitch is worked by piercing through the ribbon at the end of the stitch, leaving a ​line of ribbon with a tiny fold at the end. It's useful for making leaves and petals in ribbon embroidery designs. The running stitch is one of the most basic stitches and is usually the first stitch learned by the beginner embroidery enthusiast or sewing student. This stitch can be worked in straight or curved lines, or for assembly when finishing an embroidery project. Double running stitch, often called Holbein stitch, is worked in two passes of running stitch, with the second pass filling the gaps made in the first pass. This creates a strong stitch when used for sewing, but it's also great for working a line in two colors. Basic, flat satin stitch is an easy and beautiful filling stitch that can be used to fill smaller areas. Other variations of the satin stitch include the long and short satin stitch, which is useful for filling larger areas or creating a shaded look, and padded satin stitch, which has stitching underneath to create a thicker stitch. The scroll stitch is an elegant, decorative and highly textured stitch that resembles scrolls, waves or water and can be worked along straight or curved lines. The stitch is composed of three vertical stitches tied together with a doubled horizontal stitch. It gets its name from the bundled threads resembling a sheaf of wheat. Spider web stitch resembles its namesake and is worked by stitching a base of straight stitches, followed by wrapping the thread around those stitches. The finished web is typically a solid circular shape, although it can also be worked as a square or other geometric shape, or with an open center. One of the most basic stitches to learn is split stitch, useful for working straight and curved outlines. This stitch is worked just like its name says, splitting through the previous stitch and forming a solid line with a rough texture. Formed with a series of straight stitches, the star stitch can be worked different ways to create different styles of stars or twinkles. Stem stitch is one of the most common embroidery stitches. It is worked as a thin line and can be used to outline embroidered shapes, as flower and plant stems, and in tendrils. Stem stitch can also be worked as a filling. This stitch is easily confused with outline stitch, and although the two are very similar, they are different. Learn both with this tutorial. Standard or basic straight stitch is a simple embroidery stitch created using a straight, long stitch individually or in patterns. This popular surface embroidery stitch can be worked on any type of embroidery fabric. Using straight stitches arranged in groups you can make leaves and flowers or geometric designs. Detached woven picot stitch forms a 3-dimensional leaf or petal shape. The stitch is attached to the fabric at the base, but the rest of this woven stitch is free from the fabric. Woven wheel stitch is often called woven rose stitch, as it makes a stunning circle that resembles a rose or ranunculus flower. Similar to the spider web stitch, it starts with a base of straight stitches, followed by loose weaving which forms the solid and textured floral look.